We will sell spirit sticks and smencils during lunch. Please report to the office and sign in as a visitor. Inform the office staff you are there as a PTO volunteer to sell spirit sticks. They will provide you a money bag containing $10.00 in ones for your change (in the PTO drawer). IF the station is not already set up, a table is available inside the office and the spirit sticks and smencils are inside the library. Chairs are available inside the cafeteria. Please do not leave the table or money bag unattended. Now relax and have a blast! The children love this time and it is so much fun to see them get excited about the different items! Each item is $1.00. 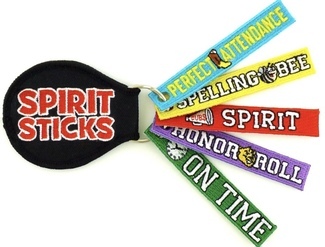 If purchasing a spirit stick, ask the child if they already have a key ring. If they do not, please give them one. After the last class has left the cafeteria, please return the table to the office, the items to the library and the money bag to the office staff. Thank you so much for helping with this quick and easy fundraiser!